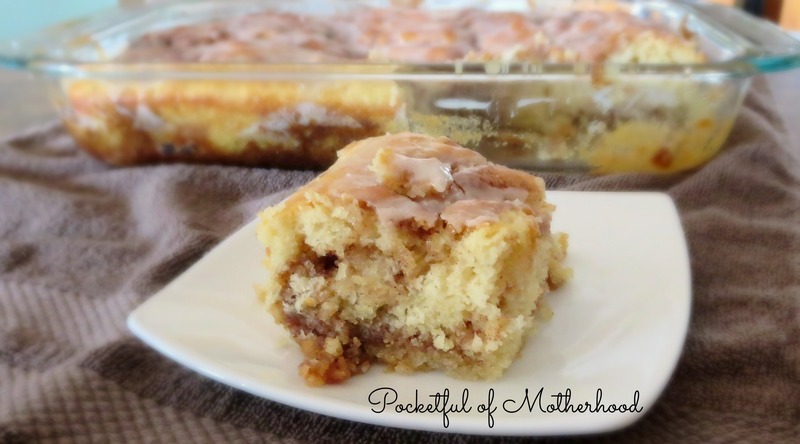 This sweet treat has all the delicious flavors of a cinnamon roll wrapped into a cake. 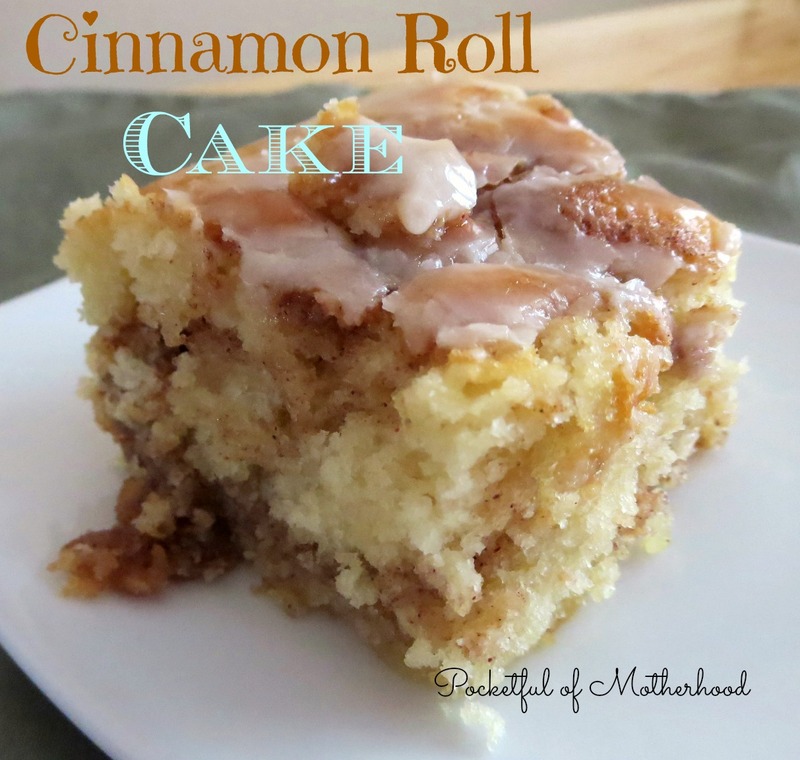 It is one of my favorite baked goods and that is why I’m taking the time to share it again with some better pictures, a slightly adapted recipe and a printable recipe! 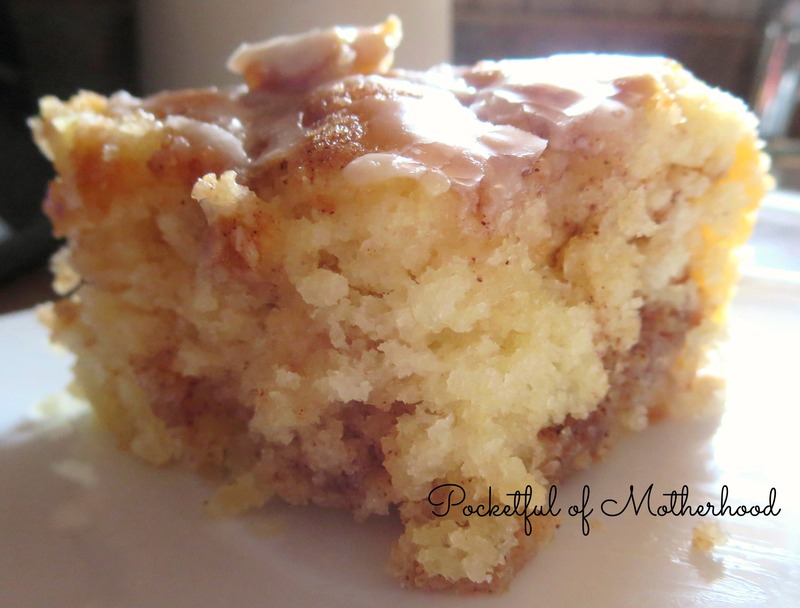 This cake is delicious for breakfast or brunch and it also makes a nice after dinner dessert. My favorite way to eat it—for breakfast with a hot cup of coffee. The original recipe calls for vanilla extract, but I recently discovered (kind of by accident) that it is also tasty with almond extract. I went to make this cake a few weeks ago but I was completely out of vanilla. So I decided to substitute almond extract—and it was delicious (although it was missing something without the vanilla). I decided that a combination of almond and vanilla would be perfect. I adapted the recipe and substituted almond extract for some of the vanilla extract. I also changed the glaze slightly by decreasing the amount of powdered sugar and milk that the original recipe calls for. This cake is best served warm. If you eat it the next day I recommend warming it in the microwave for a few seconds first. I hope you enjoy this cake as much as my little family and I do! 1. For the cake, mix together the flour, salt, sugar and baking powder. 2. Add the milk, eggs, vanilla extract and almond extract. Then slowly stir in the melted butter. Pour the batter into a greased 9×13 pan. 3. 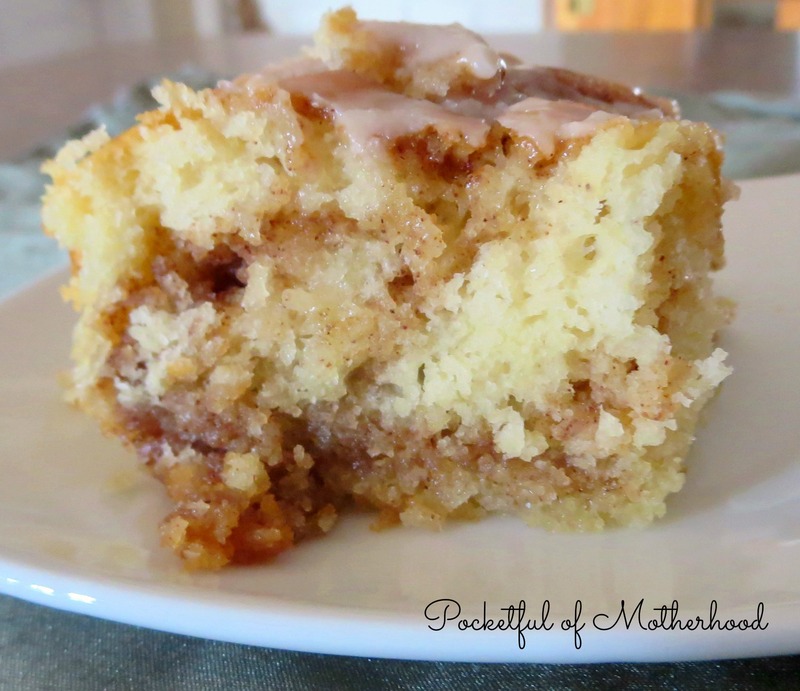 Make the topping by mixing together the softened butter, brown sugar, flour and cinnamon. Drop evenly over the batter and swirl into the cake with a knife. 4. Bake at 350 degrees for 28-33 minutes. Remove from the oven and let cool slightly. 5. For the glaze mix together the powdered sugar, milk and vanilla. It should be slightly thick but still runny enough to pour. Pour the glaze over the warm cake. The glaze will harden a little as it sets.